Fans visiting the Isle of Man for the annual TT races have been urged by Manx Police to "respect our roads" at the launch of the 2015 safety campaign. 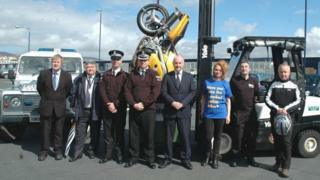 Members of the roads unit unveiled this year's "Don't bin it" campaign at the Sea Terminal in Douglas. In 2014 there were 102 accidents during the festival, with one fatality. More than 40,000 people visited the island. Police said social media would have a "crucial part to play" in keeping the public informed this summer. Road Safety Manager Gordon Edwards said previous campaigns have helped reduce fatalities. He said: "I would urge fans to get to their favourite spectator spots well ahead of races getting under way. "The roads are at their busiest - and the most collisions occur - in the "golden hour" immediately before the course closes." The poster campaign will be launched at ports in the UK and Republic of Ireland ahead of the event. Covert motorbikes will again be used by police during the fortnight and the Mountain Road will operate a one-way system. Home Affairs Minister Juan Watterson MHK said the significant increase in people and traffic makes the TT an "extremely demanding time" of year for frontline services. The Isle of Man TT will get under way on 30 May with races beginning on 6 June.